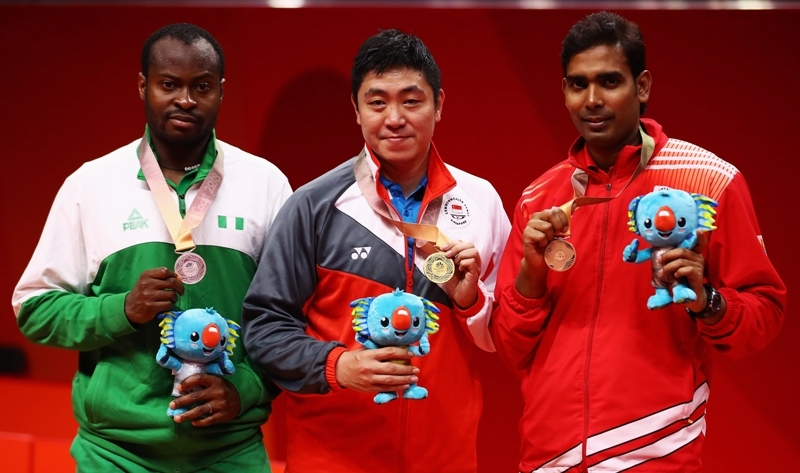 Despite missing out in the gold medal battle against Singapore’s Gao Ning, Nigeria’s Aruna Quadri has said that he was satisfied with the silver medal than going for bronze at the 2018 Gold Coast Commonwealth Games held in Australia. Having come from 2-0 down against the experienced Singaporean, Quadri succumbed to the experienced of the two –time silver medalist with a 4-2 loss to settle for silver medal in the men’s singles being his best outing at the games. At the 2014 edition in Glasgow, Scotland, it was same Gao Ning that edged out Quadri in the round of 16 but this year in Australia, the Nigerian seeded number one gave a good account of himself on his way to the final. The final being the last match in the table tennis event of the games brought out the best in the two players with Quadri making excessive use of his powerful shot while the skillful play by the Asian star was what saw him through the explosive encounter. With the silver medal, Quadri remains the second best players from Nigeria to play in the final of the men’s singles as he failed to equal the feat of his compatriot – Segun Toriola, who won the men’s singles title at Manchester 2002 in England.